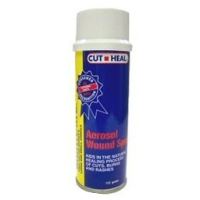 Cut Heal Multi+Care Aerosol Wound Spray offers great support to the natural healing process of cuts, grazes, burns and rashes, through its effective triple action formula. This gentle aid first seals the affected area, providing a protective barrier against bacteria. It then gently cleans and disinfects the wound whilst encouraging natural healing from the insight out, stimulating regenerative tissue and the regrowth of surrounding hair. More often than not Multicare Cut Aerosol Wound Spray heals without leaving any visible scarring.